Pension Partners put together the excellent visual below illustrating the point where government bonds move into negative territory on the duration scale. As a reminder, green does not mean good, it means slightly less insane because you are not actually paying the government to hold your money. With the announcement this week the European Central Bank (ECB) will begin purchasing corporate bonds (in addition to the 800+ billion euros of government bonds it has bought since March 2015), traders have already begun to front-run the purchases, pushing corporate yields to the lowest in history. Corporate bonds in Japan have already moved into negative territory as the Bank of Japan began purchasing negative yielding corporate bonds back in January. Bloomberg estimates the entire size of the European corporate bond market available to purchase under the ECB's guidelines is about 620 billion euros. This means they will quickly "become the market" for these bonds and liquidity will disappear (which has already occurred in Japan). Ironically, U.S. corporations that have foreign subsidiaries can participate in this insanity by issuing debt in European and Japanese markets. Look for corporations to flood the market with debt in the coming months even if they have no need for additional capital. They will likely use the money to repurchase their own shares in an attempt to drive stock prices even higher. Corporate executives are paid to make stock prices go higher every quarter, and central banks are telling corporations they will print money, give it to them, and then pay those companies for taking the free money (once rates go negative). Can you see how QE flooding the markets creates simultaneous asset bubbles through the spillover effects? Meanwhile, with banks being penalized for holding cash with the European Central Banks (they are now charged .04% because rates are negative), one of Germany's largest lenders, Commerzbank, is considering putting physical cash in secure vaults. There are already plans in place to make this process more difficult for banks (they are reducing the availability of larger denominated notes). The central banks do not want anyone holding cash. They want all available capital flooding stock, bond and real estate markets to drive each bubble further and further away from prices that can be supported by the real underlying economy. The global bond bubble has now pushed rates to the lowest levels we've seen in 5,000 years. 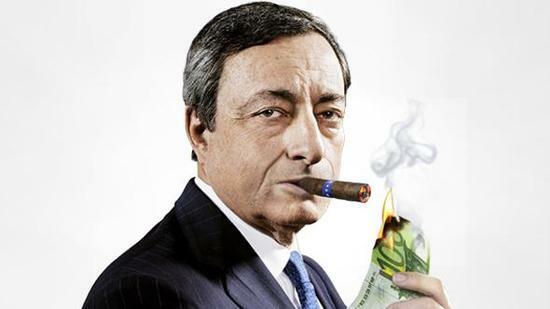 Mario Draghi, the head of the European Central Bank, must surely be pleased with the distortions he is helping to create in the financial markets. Every day the global systemic crisis builds under the surface, but as long as bond yields keep falling and stocks and real estate keep moving higher, let the good times roll.